So, turns out I have another “disorder” but this one is clearly genetic. It’s a forceful, pulsing, driving – insatiable yearning to iron. As in clothes. No mystery there, anyone who knows my mom, knows she has, I would actually yes, call it an addiction to ironing. I wouldn’t go so far as to put her name up for the Intervention TV show, maybe my strange addiction. She is of the mind that you should be able to slice a ripe tomato with the point of your ironed jeans, yes, ironed jeans, like I said she has a problem. Mom, they’re jeans not Ginsu knives. Every so often, usually on seniors day at the mall, you’ll see one of our illustrious elders walking through the mall, the razor-sharp point of their jeans cutting through the air, much as the majestic prow of the Nina, Pinta and the Santa Maria did through the ocean on their historic journey to the new world. Jeans were never made to be ironed, it’s like seeing a five legged baby panda-dodo hybrid coming out of a gas station bathroom. It’s just weird. I have never been a fan of wrinkles, just don’t care for them. What do you get when you cross the high-octane, adrenaline fuelled, pulse racing, knee shaking action of extreme sports, with the murky fluff in the seedy bellybutton of household chores? What do you get when scream and steam collide? What happens when you’re living on the edge of life’s less than perfectly angled crease? 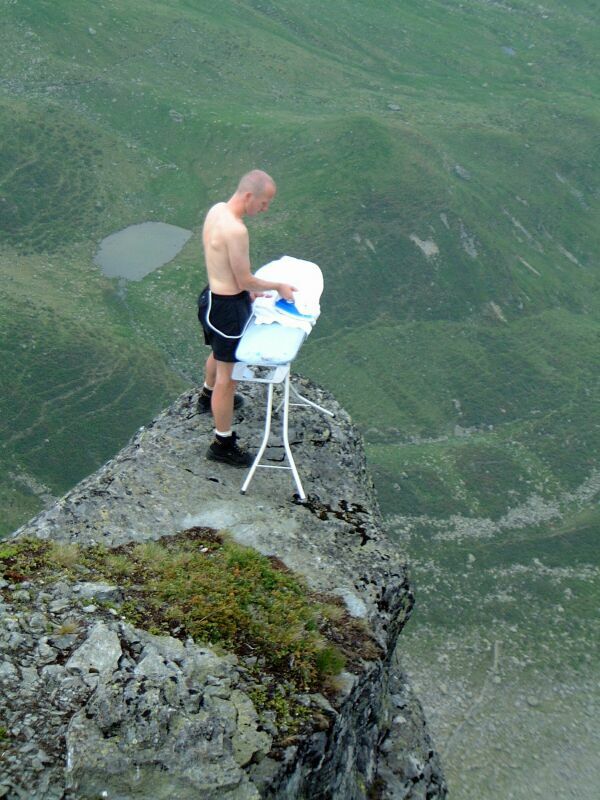 The answer, my friends, is Extreme Ironing. Their mission is simple. 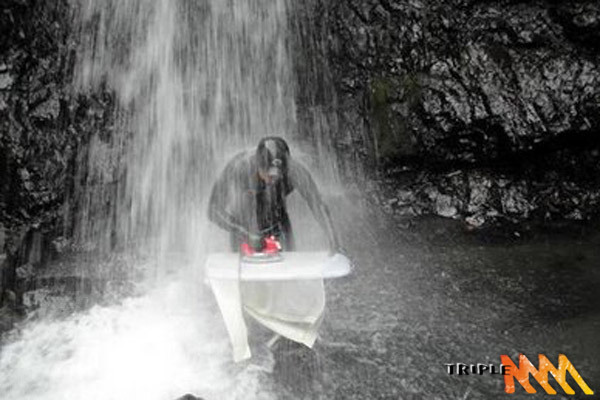 To tame Mother Nature, conquer un-explored territories, battle the earth’s harshest elements, and to do it all with nothing more than a collapsible ironing board, hand-held steam iron and an unshakable passion to stamp-out wrinkles. 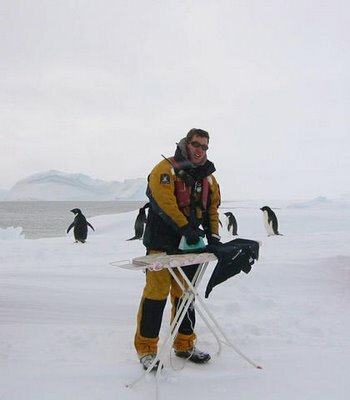 Extreme Ironers from across the globe have been churning out silky-smooth shirts in deserts, on mountain tops and even at the North Pole. 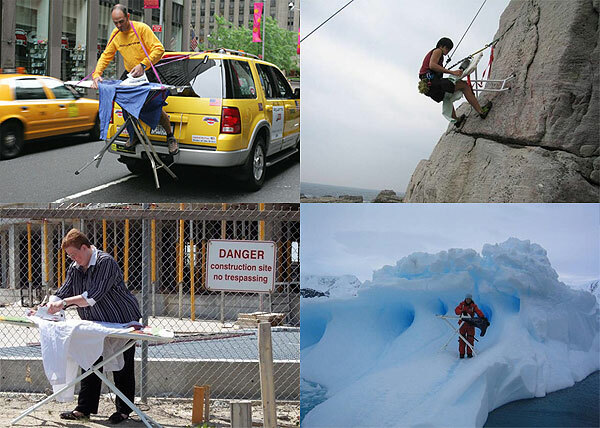 This bunch of highly-trained athletes will stop at nothing in their quest for pressing perfection, and momentum is quickly growing to grant Extreme Ironing Olympic sport status. 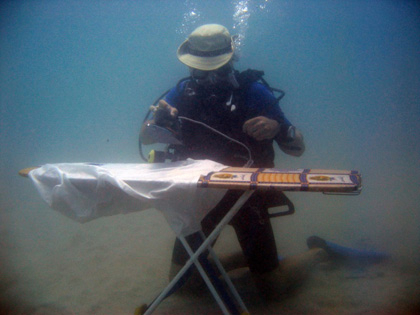 If Extreme Ironing catches on in America, expect it to spawn a number of off-shoot activities such as Monster Vacuum Cleaner Off Road Racing, The 24 Hour Toilet Bleaching Time Trial, and Swiffer Wars. This is the stuff that pay-per-view was invented for…..
God Bless us, God Bless Us Everyone….. the world is full of such beauty and then after traveling to the furthest reaches of the planet to find it, you show up and find one of these jack-wagons ironing…. ← I see stress as Lady Macbeth saw blood…. That’s the whole idea, comedy-tainment. I wan to teach, to nurture, to feed the yawning maw of knowledge within each and every one of us. Wow, aren’t my intentions so noble, so beyond reproach… no I’m just a goof with a keyboard. Thanks very very much for your kind words… they are much appreciated.